Salal. An iconic native shrub that occupies the understory of the forests from the coast to the Cascades- but it skips the Willamette Valley enjoying more mesic environs. A mounding evergreen that forms large colonies in time. Ranges in height from 2′ to 6′ depending upon its situation. Spread is indefinite when happy. 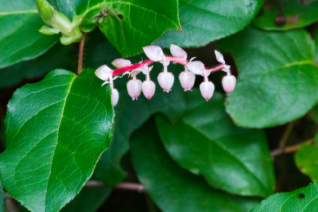 In spring chains of white urn shaped flowers transform into edible berries. Very handsome foliage is used as long lasting cut material. Can be tricky to establish. Shade to part shade is best in rich, humus rich soil with regular water. To establish water, water, water. And apply a liberal deep mulch. Avoid hot sun and compacted dry soils. Once it gets going, its yours forever. Oregon native plant.